In previous studies, we demonstrated that recombinant Adeno-Associated viral (rAAV)-mediated gene transfer of the doxycycline-regulatable system1 allows for the regulation of transgene expression in the retina of nonhuman primates after intravenous or oral administration of doxycycline2,3,4. In addition, it was shown that administrating different amounts of doxycycline (Dox) resulted in a dose-response dynamic of transgene expression. AAV gene therapy has raised hope for the treatment of patients with Leber congenital Amaurosis, caused by mutations in the retinal pigment epithelium (RPE)-specific gene RPE65. The preliminary results of three clinical trials5,6,7,8 suggest some improvement in visual function. However, further improvements might be necessary to optimize vision recovery and this means developing vectors able to generate transgene expression at physiological levels. The purpose of this study was to investigate the ability of the doxycycline-regulatable system to regulate retinal function in RPE65-/- Briard dogs9. 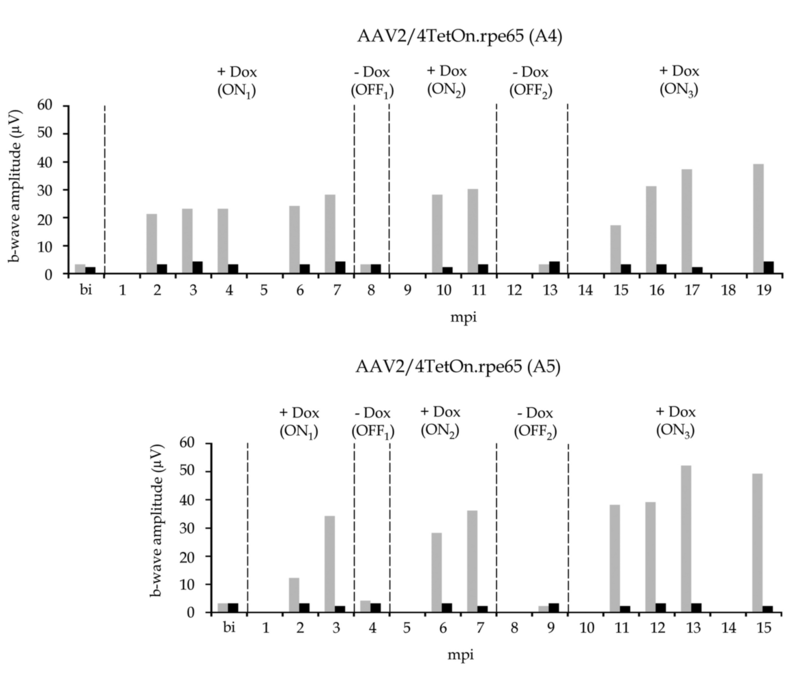 Recombinant AAV vectors expressing RPE65 under the control of either the TetOff and TetOn doxycycline-regulated promoters, the CMV constitutive promoter and the RPE65 specicfic promoter were generated and administered subretinally to seven RPE65-deficient dogs (Figure 1). Figure 1: : (a) Structure of rAAV vectors. (b) List of treated dogs and rAAV doses injected. 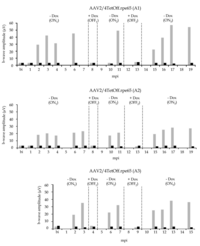 In the injected eyes in dogs treated with AAV2/4TetOn.rpe65 (Figure 2), in the presence of Doxycycline, the restoration of photoreceptors function started at 2mpi, reached a maximum at 3mpi (20-50µV) and remained stable thereafter. Upon Dox removal, the retinal function returned to baseline level within 1 month. 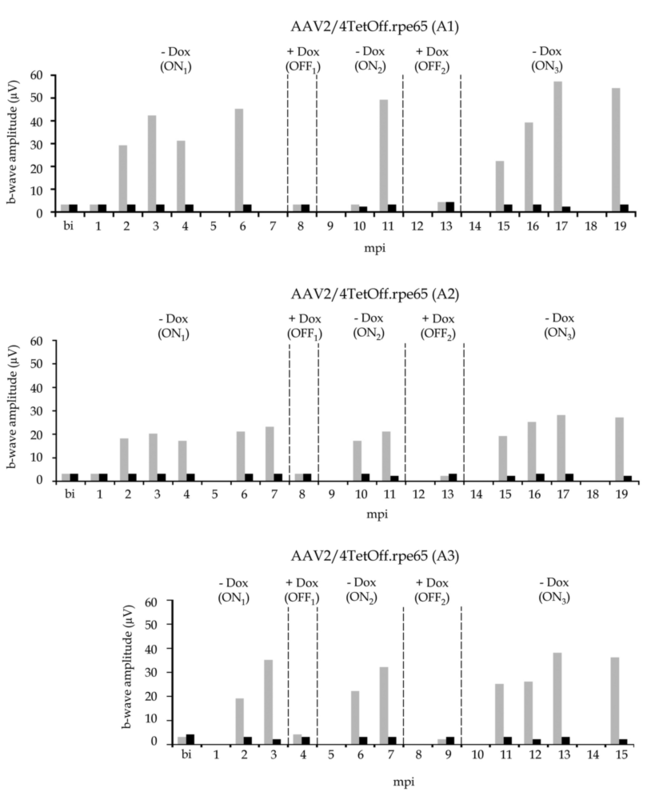 In the injected eyes in dogs treated with AAV2/4TetOff.rpe65 (Figure 3), in the absence of Doxycycline, the restoration of photoreceptors function started at 2mpi, reached a maximum at 3mpi (20-60µV) and remained stable thereafter. Upon Dox administration, the retinal function returned to baseline level within 1 month. Cycles of Dox induction and de-induction are reproducible in all dogs after AAV2/4TetOn.rpe65 and AAV2/4TetOff.rpe65 subretinal injection. Behavioural tests show that treated dogs never displayed recovery of vision at any time. All treated retinas showed long-term regulation of retinal function but nonrescue of vision. In parallel to the 5 dogs treated with the Dox-regulatable vectors, 3 additional dogs were used as controls (Figure 4). Two dogs were treated with the constitutive AAV2/4CMV.rpe65 and AA2/4RPE65.rpe65 respectively. NA is a non-affected dog. The ERG max amplitude was approximately 250 µV in the non-affected dog. 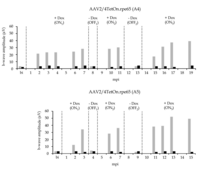 In the AAV2/4RPE65.rpe65 treated dog, the recovered amplitude was approximately 100 µV at 3 months post-injection and remained stable thereafter. In spite of the larger volume of vector injected into the AAV2/4CMV.rpe65 treated dog, the amplitude was around 40 µV at 3 months post-injection and increased to up to 74 µV between 3 and 6 months. We think that the strength of the CMV and CMV-based promoters is lower than the strength of the RPE65 promoter in vivo. We demonstrate for the first time, that it is possible to use the TetOff and TetOn system to regulate retinal function in RPE65-deficient dogs. Such a regulatable system will therefore be valuable to assess the level of RPE65 expression necessary to obtain an optimal rescue of retinal function and vision. Unfortunately, the CMV-based TetOff and TetOn promoters seem much less efficient than the specific RPE65 promoter and lead to a lower level of retinal function recovery, which prevents any dose-response study or a more accurate evaluation of the promoter strength necessary for an optimized rescue of vision. Our results suggest that the nature of the promoter may be critical for the recovery of retinal function and vision in RPE65-deficient dogs and the need to develop AAV vectors that generate optimal RPE65 expression for the treatment of patients. We thank the Vector Core (vectors.nantes.inserm.fr) at the University Hospital of Nantes. 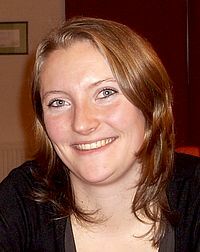 This work was supported by the Association Française contre les Myopathies (AFM), the INSERM, and the Fondation pour la Thérapie Génique en Pays de la Loire. Gossen, M, and Bujard, H (1992). Proc Natl Acad Sci U S A 89: 5547-5551. Stieger, K, Belbellaa, B, Le Guiner, C, Moullier, P, and Rolling, F (2009). In vivo gene regulation using tetracycline-regulatable systems. Adv Drug Deliv Rev 61: 527-541. Stieger, K, Le Meur, G, Lasne, F, Weber, M, Deschamps, JY, Nivard, D, et al. (2006). Stieger, K, Mendes-Madeira, A, Meur, GL, Weber, M, Deschamps, JY, Nivard, D, et al. (2007). Bainbridge, JW, Smith, AJ, Barker, SS, Robbie, S, Henderson, R, Balaggan, K, et al. (2008). N Engl J Med 358: 2231-2239. Maguire, AM, Simonelli, F, Pierce, EA, Pugh, EN, Jr., Mingozzi, F, Bennicelli, J, et al. (2008). N Engl J Med 358: 2240-2248. Hauswirth, W, Aleman, TS, Kaushal, S, Cideciyan, AV, Schwartz, SB, Wang, L, et al. (2008). Phase I Trial of Leber Congenital Amaurosis due to RPE65 Mutations by Ocular Subretinal Injection of Adeno-Associated Virus Gene Vector: Short-Term Results. Hum Gene Ther 7: 7. Maguire, AM, High, KA, Auricchio, A, Wright, JF, Pierce, EA, Testa, F, et al. (2009). Lhériteau, E, Libeau, L, Mendes Madeira, A, Deschamps, JY, Weber, M, Le Meur, G, et al. (2010). Regulation of retinal function but non rescue of vision in RPE65-deficient dogs treated with doxycycline-regulatable AAV vectors.